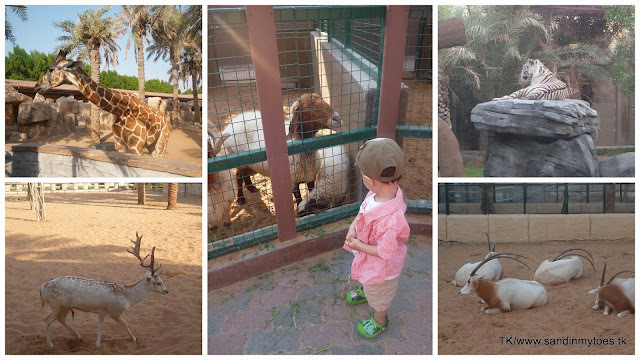 Over the long weekend just after Little Dude's second birthday, we decided to head over to the Emirates Park and Zoo in the neighbouring emirate of Abu Dhabi. He had a jungle-themed birthday, so it seemed appropriate to take him to a zoo! More importantly, the little guy now recognises many animals and I wanted to see how he would respond to seeing them up close. This is a fairly new attraction and I had heard a lot about it, so we made it a plan. It was only a 1.5 hour drive from where we stay in Dubai. The weather was a little hot when we reached at half past three, but the zoo has a cooling system where little jets of water are sprayed overhead, almost like the drizzle of rain. First up, we visited the primate section where Little Dude was excited to see the jumping monkeys! The amphibians and reptiles didn't attract him as much, mostly because many of them were busy hiding behind rocks. The best part, and the key attraction of this zoo, is the giraffes section. It is a huge enclosure which allows people to feed the giraffes, zebras and deer. Little Dude was pretty fascinated with the animals and didn't mind seeing them so close, even though he was so close to them. Another good thing about this enclosure is that you can see the animals from above from a small tower. That view was just above the giraffes' heads and quite a sight! The birds section was predictably a favourite with Little Dude, but I think he didn't like seeing them in cages because he loves running after them! The farm animals like goats, sheep and donkeys were popular with the other kids, but he liked the ostriches and flamingos better. The predators and elephants section could be viewed through glass windows from an air-conditioned area - where we saw lions, leopards, tiger,white tigers and elephants. The park is in an expansion phase with a lot of construction happening in and around it, so it will be interesting to see what new attractions they have to offer in the future.We may just head back for another visit! P.S: This is a personal post and not endorsed or sponsored by Emirates Park and Zoo. You got some great shots, looks like it was a fun day. Visiting from Magic Moments at The Oliver's Madhouse! Great shots. I love taking my toddler to the Zoo here in Washington, DC. Love the fact that you can actually feed the giraffes and Zebras. Yes it was, thanks for stopping by! Thanks, we didn't attempt to feed them but we went pretty close! wow this places looks amazing!! its by far one of the best zoo's i have seen!!! I liked that it was an 'open' zoo. Can't wait to see what new attractions they come up with! This zoo sounds pretty neat! I have always been fascinated by giraffes! In Dubai, anything is possible! Yes, it was a nice place - thanks for stopping by. It sounds like a really comfortable trip - which is definitely not my usual experience of visiting zoos. It's great for children to actually get to see real animals up close, isn't it? Looks like a fun day! My kids love the zoo :) Lovely photos, you got really close to the animals! Yes, it if they were behind cages, I don't think we would have liked it so much. Yes, definitely a memorable experience! What a lovely collection of animals that are obviously well taken care of in suitable enclosures. You've taken some great photos and how amazing to be able to feed a giraffe - they are beautiful animals. It sounds like you had a great day out, thanks for linking up and sharing with Country Kids. Thanks, it was a pleasure to be part of Country Kids! We love the Zoo! What a great selection of animals you got to see. Yes, it was a memorable trip! Thanks for stopping by.